Some of the biggest news in the stock photography world was a couple of weeks ago when Dollar Photo Club (DPC) announced they’re closing their doors for good on April 15, 2016. DPC was a popular stock photo site with millions of premium stock images, vectors, and fonts, that sold a membership that got you 100 image downloads for $99. DPC, along with it’s sister site Fotolia, was purchased by Adobe Stock this past January. Any remaining downloads members have on the site can be made up until April 15, but for those who want to join Adobe Stock, they will honor your remaining downloads for an entire year. For those of you designers and small businesses who download hundreds of images a year, our sister site StockPhotoSecrets.com created a new membership program — the 99club — that offers 200 XXL image downloads for $99. Yes, that is correct, by joining with Stock Photo Secrets’ (SPS) 99club, you can choose from over 4,000,000 premium stock photos, vectors, and fonts. Click here to learn more about our Dollar Photo Club Alternative the 99club! The 99club membership is for a limited time only, meaning that we only have a few memberships left to offer you 100 more downloads for the same price as DPC had offered. 99club is the Dollar Photo Club alternative that not only gives you more, but for this of you who buy a membership now, will be able to renew at the same price! The membership deal gives you 200 XXL image downloads of any size, including vectors (over 600,000), premium stock photos, and fonts. The SPS collection is more than 4,000,000 images that are being updated monthly with about 60,000-80,000 images being added monthly. A subscription to the 99Club comes with no additional fees and will auto-renew after one year (the same price and deal). You can also download as many image as you want per month, and if you download more than your 200, each additional image will cost you $0.99 per download, but you can buy even more image packs like 50 more image downloads for $49, or 100 more image downloads for $69, making it even cheaper than $0.99 per image. Over 600,000 vectors to choose from! An Extra 10 free XXL images for signing up (210 images) use the rebate code “helpme10”. SPS created the 99club as a response to DPC closing, and wanted to be able to offer you a better deal. This has raised a few questions among potential designers and small business owners who need to buy hundreds of images per year. SPC has often been asked whether or not SPS will be around, especially since DPC had only been existence for 2 years. Well, the great news is, SPS has been around for many years and has no intention of closing. The 99club is a limited time offer only available for a short time, meaning that when all spots have been filled we can no longer offer you the deal. There are still a few memberships available, so make sure to click on one of the links or buttons throughout this page to get 200 images for $99. Another question we are asked is whether or not the images on our sites have the proper model and property releases. Yes they do, so you won’t have to worry about any licensing, you just download images and start using them. The images are completely royalty-free, so once you download you can use that image forever, and even after your membership expires. 1. Will you close like Dollar Photo Club? No, we have been around for years and we plan on staying a lot longer. 2. Can I renew my 99club membership after one year at the same low price? Yes. You can renew your 99club after one year at the same price. 3. Is there a limit to what images I can download? No, you can download any image, vector or illustration from our over 4.000.000 images, over 600,000 vector images, with 60,000-80,000 more images being added every month. 4. Can I still use the images after my membership expires? Absolutely, you can use your downloaded images forever! 5. Do you have more image pack deals after you've used up all 200? Yes, and you can buy as many as you like. You can get 50 more image downloads for $49, or 100 more image downloads for $69. 1. What do you mean when you say XXL? XXL means you can print confidently at A3 size with 300dpi or 6′ x 6′ with 72dpi. 2. Will I be able to renew my 99club membership at the end of the year? Yes, once you join you'll be able to keep your membership for as long as you wish. 3. Are all images licensed for commercial use? Yes, all images are fully royalty-free with the relevant model and property releases (where needed) already taken care of. 4. What does limited availability mean? We can only give membership to a limited number of customers… Sorry. 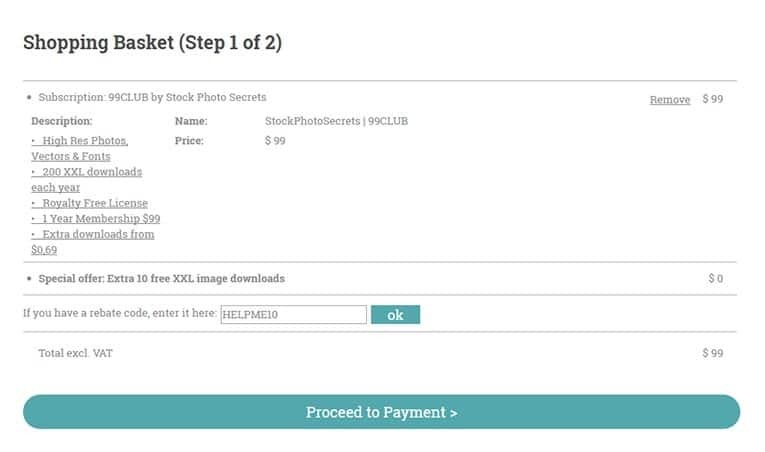 Stock Photo Secrets will manually add another 10 XXL stock photo images to your account after you sign-up for the 99club for free without you having to do anything (just add the rebate code helpme10). This offer is only available for a limited time and to a limited amount of customers, so to avoid any issues, sign up now for a better Dollar Photo Club alternative before it’s too late. It’s also important to note that the 99Club membership only offers premium stock images, vectors, and premium fonts, and not videos. We are disappointed to see Dollar Photo Club close, and we hope that their current customer’s transition to Adobe Stock will be easy. Adobe Stock is a great site, so former DPC members with remaining downloads will still have a great place to get high-quality images. Even though we are sad to see DPC go, we are glad that we can offer you a deal that gives you even more than the old DPC deal! And we’re even happier to offer you 210 vector downloads if you sign up for our offer now. Don’t delay, get your membership while the offer is still around. 15% Off in Shutterstock Images with our Special Coupon Codes! What are Royalty Free Images? Best Guide to use Royalty Free Photos! © 2019. Stock Photo Guides. All rights reserved.